It was at the 2009 Emirates Cup that Jack Wilshere first came to mine and many people’s attention. As a baby-faced 17-year-old, he burst onto the scene at the pre-season tournament and by the end of it he was the name on everyone’s lips. For most that year’s Emirates Cup was a mere friendly competition, a chance to get some fitness in ahead of the upcoming campaign. But not for Wilshere. Instead it was his opportunity to shine and show what all the fuss was about. He tore Glasgow Rangers apart during the opening day’s action, scoring twice in a 3-0 win against a side who only 12 months ago had reached the final of the then UEFA Cup. Wilshere’s performance naturally drummed up the typical media hype, indeed the Daily Telegraph’s comparison to a young Paul Gascoigne. For me, however, Wilshere reminded me of Joe Cole during the early stages of his career. He had the same physique and low centre of gravity that enabled him to drift past players at consummate ease. The fact he was deployed out wide before cutting inside only added to the similarities for me. Whoever Wilshere reminded you of, and the comparisons soon began to included Barcelona great Andrés Iniesta, there was simply no denying that a star had been born. And it is that which makes it so strange that now, seven years on, we find Wilshere on loan at Bournemouth as he tries to reignite his career. Back in 2009 people would have told you to get your head checked if you predicted this would be the scenario – not least because back then the Cherries were dwindling in League Two and only staying up thanks to a last gasp 2-1 win over Grimsby Town. However, the situation sums up the very nature of football and why we all love the game. You can never predict what is going to happen and in Wilshere’s case he is simply reacting to the hand he has been dealt. Injuries have undoubtedly plagued his development, while Arsenal’s financial clout and the ability to spend £30m on the likes of Granit Xhaka has also made progress difficult. But credit must go to Wilshere for deciding to go out on loan. It was he who pushed Arsène Wenger into the decision, when the Frenchman was otherwise more than happy to keep a player he clearly admires around. In Bournemouth manager Eddie Howe’s own words Wilshere was being “brave”. He could have quite easily stayed at Arsenal, collecting a sizeable wage and playing for the club he loves. But with first-team football not guaranteed and his place in the England squad gone, Wilshere decided to be bold. “He’s picked a very brave decision for me,” said Howe in the days after Wilshere had moved to Bournemouth on transfer deadline day. “He’s gone to a smaller club, he’s gone somewhere where there’s not everything here, there’s not everything done for him. Eyebrows were of course raised when Wilshere cropped up at Bournemouth, especially when there had been talk of interest from AC Milan and Roma. However, when you hear Howe discuss his latest addition you understand why Wilshere went there. There is something immensely likeable about Howe, but what’s more you find everything he says believable and understandable. You buy into his way of thinking almost instantaneously after meeting him. This is a man who spends close to 16-hours a day at the training ground. He is often the first in, arriving at around 6 am, and that attention to details comes across when he addresses the media. Now, every week he fields questions about Wilshere as the midfielder is naturally a great source of interest at every match. And while he may have only been working with the 24-year-old for a few months he has very quickly understood how he needs to be managed. Of course, Bournemouth monitor him with every ounce of the latest hi-tech equipment but more than that Howe is using another piece of kit to manage his prized asset. “It’s done with a very complicated tool called my eyes,” he said with a wry smile after Bournemouth took on Everton in September. Back then Wilshere certainly needed to be watched as he was well off the pace. Through my work I have been lucky enough to travel down to the south coast several times this season, including for Wilshere’s debut. I have been there three times – for Wilshere’s first game v West Brom, that match v Everton and last weekend for the clash with Sunderland – and over that time the transition has been remarkable. During his debut, Wilshere looked like an ex-pro seeing out the twilight of his career at a smaller club. There was plenty of nice touches and the vision was there, but everything was so slow that the game almost passed him by. A few weeks later for the Everton match improvements were clearly evident, but Howe was still slowly increasing Wilshere’s minutes as he tried to get him back to his best. However, come last weekend, it appeared as though all of Howe’s work had paid off. 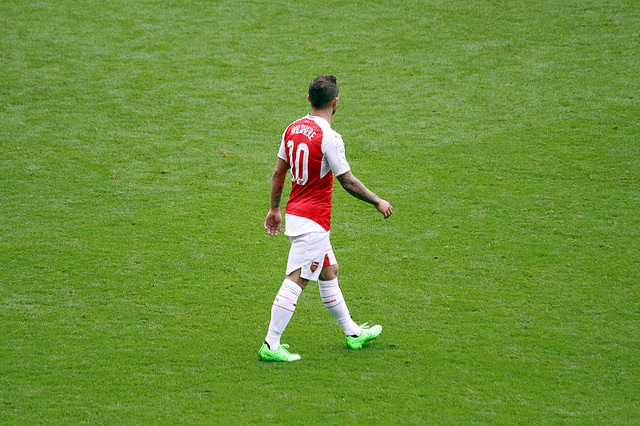 Wilshere was, I must admit, as good as I have seen him for a long time. That sharpness he had shown in his youth was back and he was zipping the ball about with lots of one touch. Everything Bournemouth created came through him as he revelled in that no.10 role he played for Arsenal’s 2008 FA Youth Cup winning side. Indeed, after watching him complete 90 minutes in which he was voted man of the match, Howe’s only complaint was that his team didn’t get the ball to Wilshere enough. For anyone watching and wondering if he deserved an England recall, this was as clear an answer as Wilshere could give. Gareth Southgate is not blessed with midfield options and for me it is a no brainer to recall Wilshere after seeing him in action against Sunderland. “I don’t think there has ever been any questioning of his quality,” said Southgate on Monday. It is, for Wilshere, a small victory to be recalled when three months ago he took the plunge to go out on loan. This, at the very least, justifies his decision and if he continues to develop as he currently is under Howe people would be foolish to write him off. Back in August when he left, many wondered if Wilshere had a future at Arsenal and he too recently expressed those concerns. But the club will surely want to keep a player of his quality around, for as Southgate explained, it has never been a question of talent but merely keeping Wilshere fit. Wenger too has not given any indication that Wilshere’s future lies away from Arsenal. At his most recent press conference, he was even grinning at the fact such a question had been asked. Wenger, like many managers, has always adored Wilshere’s talent on the ball and the skill he has shown at such a young age. Just look at Roy Hodgson, who was so sucked in by the midfielder’s ability that he took him to Euro 2016 even though he was short of fitness. Oddly enough, it almost feels like now Wilshere has hit the reset button and he is back to being that baby-faced 17-year-old who sparkled as a no.10. Indeed back then, after that dazzling Emirates Cup performance, he went out on loan to Bolton. Like Bournemouth, it was a smaller club designed to give Wilshere the minutes he needed to progress his game. It certainly helped and, after an impressive few months, he returned to Arsenal ready to fight for the place in the first-team. Just don’t be surprised now if history repeats itself. This entry was posted in NewsNow, The Bergy Blog and tagged AFC, Arsenal, Arsene Wenger, Elneny, England, Francis Coquelin, Gunners, Injuries, Jack Wilshere, Premier League, Santi Cazorla, Wenger, Xhaka. Bookmark the permalink.